It's best to find a poodle food both you and your dog are happy with and continue feeding her this. Changing dog foods will cause her digestive problems. Limit table food. I know it's tempting to feed her the same food everyone else is eating, but resist doing it! Dog food contains the right nutrients in a balanced fashion and table food won't give this to your dog. You can check into homemade dog food and pet food recipes that will provide the nutrients she needs. 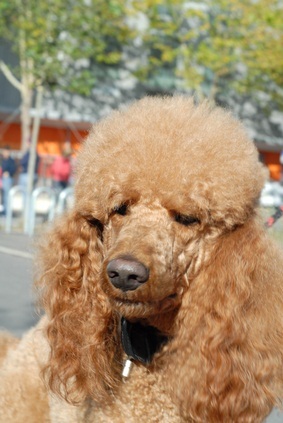 Table food can cause vomiting and diarrhea in your poodle as well as causing dog food allergies. Treats are okay in moderation. 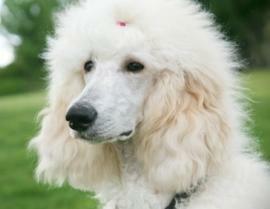 Don't overdo or your poodle won't want to eat his regular food at mealtime. Overindulging poodles with treats can also make them obese. Choose your treats wisely nutritionally and in handing them out. Some healthy choices you can give your poodle when she wants something other than dog food include homemade pet food, cottage cheese, strawberries, blueberries, apples and carrots. If you're making veggies for dinner, give your dog some cooked broccoli, green beans or sweet potatoes. Small portions of chicken, turkey and cheese are also nice poodle treats, too! 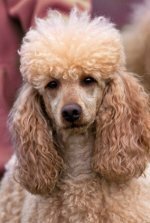 Your breeder and veterinarian can assist you with choosing poodle food that ensures your poodle receives the nutrients she needs. The right food will help keep those curly locks stay healthy. What's the difference between puppy food and dog food? Puppy food has more protein since they're growing. Senior dogs aren't usually as active and don't need as much protein. Puppy food also provides a little bit more of certain nutrients puppies, not older dogs, need. When your pup first comes home, make sure to feed him the same food he was eating at the breeder's and gradually introduce change. If you change his poodle food abrubtly, it will cause digestive upset. Check with your vet to see if your adult dog over age 7 needs a senior dog food. Dog food comes in semi moist, dry and canned. Canned food is about 70% moist, dry about 10%. Poodles like canned food, but it is the most expensive because you'll need to feed more of this to your poodle. Canned food is easier digested than the others and expiration date usually exceeds the others. It contains more meat and less filler. Dry food is the least costly and prevents tartar and plaque. Be sure to store it properly, it lasts one year. Open packages should be used within 90 days as it will lose vitamins and could start to mold. Make sure the bag is tightly closed or store it in an airtight food container. Dry foods have the least amount of fat but also have chemicals, so be careful which one you pick. For variety and to prevent food boredom, if you use dry dog food, mix it with some canned occasionally. You can also open a can of chicken broth and soak the dry dog food in to make it taste better.